Resolution: The game ends when one player runs out of cards, or when one player must play cards for a “war” but they do not have enough cards remaining in their deck and discard pile. That player loses the game, and their opponent wins. Option 1 (Creating emotions): Design a non-digital game that introduces children to the concept of grief. Post the rules and required components. If desired, also include commentary on how you approached this problem and why you think your game does (or does not) succeed. Option 2 (Persuasion): Modify the board game RISK to advocate world peace. Post your changes to the original rules. If desired, also include commentary on what you were trying to do, whether you think you were successful, and why or why not. Option 3 (Exploring the boundaries of games): Design a game that has intentionally incomplete rules, requiring player authorship of rules during the play of the game in order for it to be playable. Post your (incomplete) rules. NOTE: I think this might fit under option 3&4 but have put it here as it does have some structure and was inspired by two actual video games, although one hasn’t bee released yet. This year’s darling of E3 was the much anticipated “Scribblenauts” by the developers of “Drawn to Life” a favourite of mine. The promised freedom of the new title will revolve around how well pre-conceived interactions between thousands of objects have been implemented. The earlier work was VERY linear, but also gave the illusion of freedom by allowing players to design their own avatars. However, these designs had to fit to specific templates to enable the animations to work. So, both games are limited and limitless in equal turns – DS titles, so forgivable – and do something novel. They also fail to deliver on their promise, as all computer rendered worlds will be. Hence, EquiSCRIBBLEum. Players take turns creating a character/object interaction; see later for detailed explanation. For the first round, a player is picked randomly. Thereafter, a King of the Hill approach is taken, where other players can challenge the current leader. A successful challenger takes the lead. Unsuccessful challenges mean back to the drawing board – either new object or new ability – before a new challenge is possible. The winner is determined by the current leader after an agreed time or number of turns. Players have to represent change/status/animation of their character object using whatever method possible. A flick book stick figure transformation; using beads to make a pixel picture of several frames (hence the optional digitisation) showing a high jump for example. The winner of each challenge is decided by consensus. Whether opponents represent obstacles, combatants, etc, is entirely up to the players, but it is recommended that some story is evolved during play to help seed ideas. The quality of the art is less important than the mental duel. The transition to non-digital allows a virtually infinite number of options; far more than will fit on a game cartridge! I could also envisage one or more players setting up an environment (level?) for other(s) to navigate. Bordering on a tabletop RPG but the essential element should remain abstract and symbolic, rather than physical. Use fuel, Fuel, FUEL to rotate and slow your craft for an “Eagle Has Landed” moment! 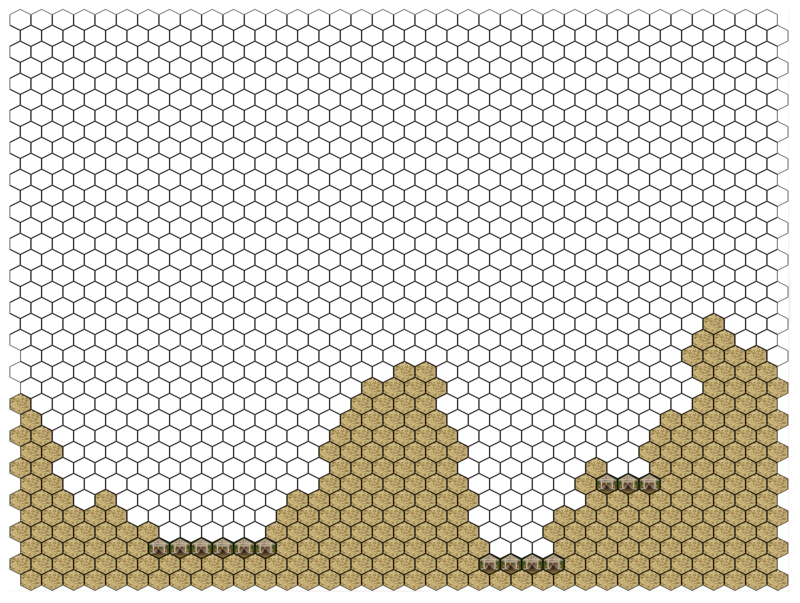 As this is effectively a simulation of gravity, two hex maps are required: One with a small playing piece for the larger wide scale view of the moon surface; the other representing the various landing sites by use of layered colour hexes, with a larger playing piece to represent the ship in close-up. In the interest of best representing the original game, the two boards will be double sided, with one side giving the large scale where the two boards are placed side by side (landscape). 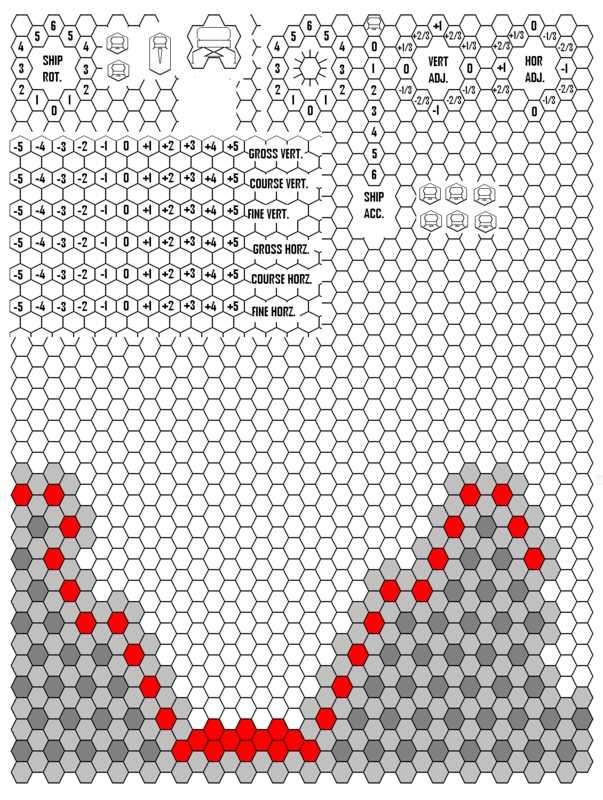 The Main Board hex map is oriented with clear horizontal rows of 36 hexes with alternate rows zigzagging in the vertical plane. This represents the small bumpiness of the landing area, and allows for a more vector appearance in honour of the original arcade game. * denotes that on a coin toss landing “Tails for Wales” – or rolling 1-3 on a die – landing here successfully gives a fuel bonus of 50 Fuel Units. The other side represents a close up view of landing areas (3 to a board), so that the board not in use for the large scale contains relevant representations of small scale landing areas; the board not in use is flipped when the ship gets close enough. Hope that makes sense! NOTE: Only done one, so you can only land on the left hand areas for the prototype. [*]a single hex size piece for the ship at long range, with the “down” pointing through a corner. Two dice are required of different colours to represent the rocket thrust: One is the course control to be adjusted by the player; the other (ideally RED) one will be used randomly, and represents the inaccuracies of fine control. Various Dials and Counters needed for play. Includes a first draft larger scale version of the first landing site that was subsequently discarded. Note: The Gross level of speed shouldn’t really be used, but is there as a warning to the player that letting speed creep up will have dire consequences. Roll the two dice for Fine Vertical, and Course and Fine Horizontal. Take the smaller from the larger to define starting values. Set a Counter on the Rocket Thrust dial to 0 indicating no rockets in use at the start. Set the Rocket Orientation Counter (a lander with protruding flame) to point the fire to the 3 on the right. Place the Lunar Lander counter with the base pointing to the right (i.e. 3pm) at the top and left most hex. 1) Vertical Course Speed is increased by +1 (Lunar Gravity). If this takes it above +5 or below -5 the Gross counter is also adjusted. 2) Vertical and Horizontal Speed is adjusted by the Rocket’s previous power setting (see below for more details). 3) Player chooses what rocket power and ship orientation to use for next turn. 5) If there is a F speed between -5 and -1 or +1 and +5 a die is rolled for both Vertical and Horizontal. If the roll is at or below the value of the F speed an additional space is moved; represents random variations. 6) If during movement the ship hits the Lunar Surface, the player has lost. 7) If near a landing strip, the player turns over the board not in use and switches to the small scale version. NOTE: Horribly complex and needs simplifying. If adding Fs takes it above +5 or below -5 then the Course is adjusted as well. When moving vertically down, moving an even number of rows is straightforward, as cells are in line. If moving an odd number of rows, place the ship between the two cells beneath the starting cell. Then apply the random vertical adjust (it may be that an additional row will be moved, removing the problem. If this doesn’t happen, roll a die. If the rocket has Zero horizontal speed, then 1-3 means left cell, 4-6 means right cell (represents buffeting). If there is any speed to left or right, a roll of 1 goes against that speed, 2-6 means the ship is moved in the direction of travel. You will see that the orientation for the small scale map emphasises more accuracy for the vertical. The rule for horizontal movement is similar to that for adjusting vertical on the larger map. On this scale map, cells reflect the Fine level; i.e. a speed of +1C+2F vertically will move the ship 6 (for the +1C)+ 2 cells (for the +2F), so the scale is for play purposes 6 times larger. This may prove too hard. For test purposes, there will be no fuel tally. For playtesting later, a limited fuel supply will be added. Landing with a vertical speed greater than +1C5F is a crash. I think, and hope, that this is enough for play testing as I have run out of time now! http://www.arcade-history.com/?n=lunar-lander&page=detail&id=1417 a REALLY good description of key features of the game; for example, did you know that this was the first arcade game to have an “Insert more coins to keep playing” option? 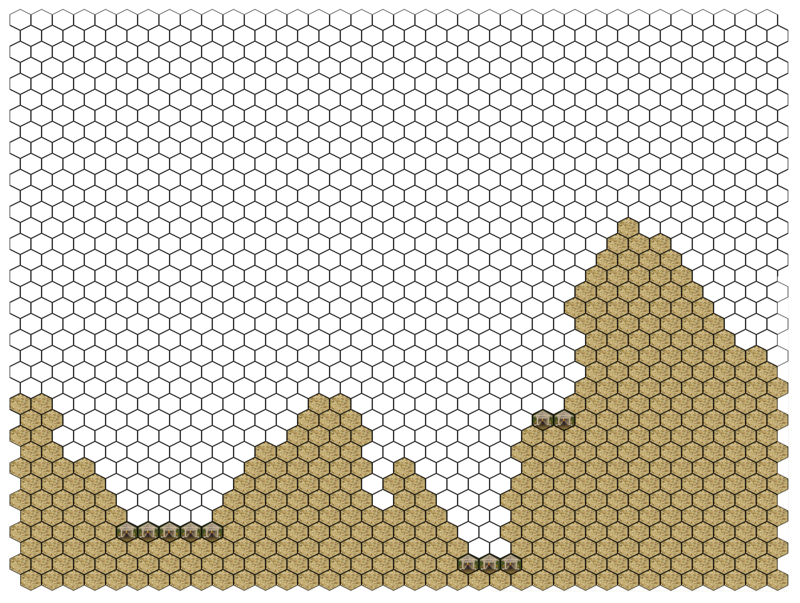 I used Hex World Creator http://www.members.tripod.com/rooksnest/academy/geography/geography.htm and MS Paint to create my board. NOTE: It is rather buggy so SAVE Often!!! Second homework for GDCU course – Something for Nothing! Lesson 2 homework was to read an article on Formal Abstract Design Tools (which I will come to later) and chapter 2 of Schreiber and Brathwaite, which included several end of chapter exercises (subsequently were confirmed as not being necessary, but desirable) that were the topic of some discussion on the forum, and concern over USA bias in content. This was acknowledged as something that had only come up because of the course being international in scope, with previous deliveries only be presented in America. It wasn’t something that I particularly noticed as problematic, but mention of the Civil War in one exercise, was an issue for a few. One respondent put it in context, stating it was likely that many US citizens would know as little as non-residents, but it raises interesting issues regarding distance delivery and the internationalisation agenda. It should also be noted that the GDCUwiki is being used by volunteers to translate the main site lessons into Espiranto, Spanish, Portuguese, Italian, Bahasa (Indonesia) and French. All done free, because the course is being done free. An important lesson for all! On to the chapter 2 exercises: The first was actually just the Lesson 1 15 minute game challenge, but Lesson 2 also required that the game be revisited and revised after play testing. I actually found this process (for which I should thank several generations of my family, who I stole from celebrating my mother’s 70 birthday over the weekend) very enlightning as a few issues I thought would arise didn’t. Anyway, the revised version of the rules and comments on the play testing are in the comments section of this post and on the official course wiki So, Challenge 1 was relatively straight forward. 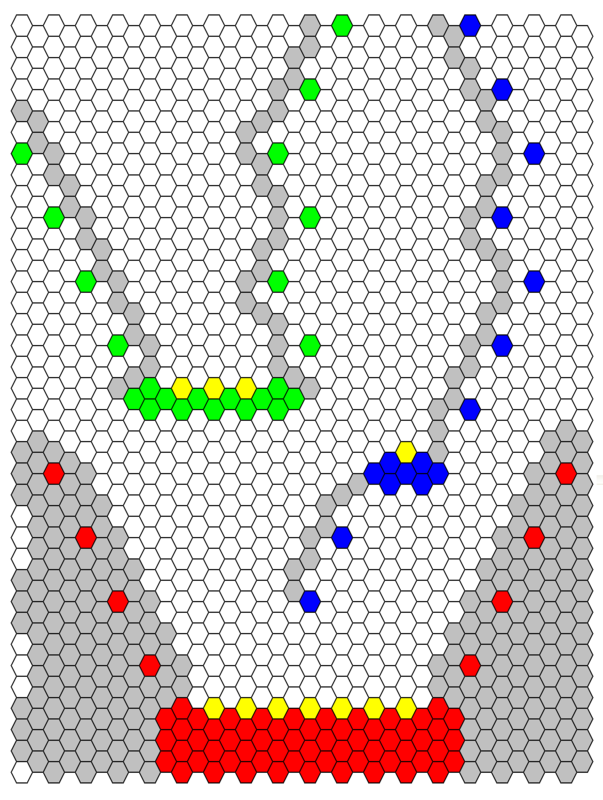 Exercises 2-4 where to repeat the 15 minute process for a territorial acquisition game, an exploration game, and a game with a “pass over/pick up” mechanic respectively. I’m going to revisit these later, but the “must do” for Lesson 3 has been revealed – I am playing catch up with the course, so lessons 2&3 are being done concurrently, and it seems apparent that quite a few other students are in the same position) as being basically the 5th Challenge from chapter 2, called the “Iron Designer Challenge”, but focussing on World War One instead of the American Civil War (see comments above) with three levels of challenge without using territorial acquisition or destruction of the enemy as the primary mechanic. More on that in a future post. Getting back to the FADT article. It, like most entries on gamasutra.com was well written and informed. Like a few articles, it doesn’t have the peer review that allows generalisations to be made without justification or much evidence. Having said that, it was interesting to see the need to express things more formally than “it was/wasn’t fun!”. Much like the artist’s curse of “I know what I like, and it isn’t…” that is probably at the heart of the same formulaic game clone sequels coming out year in, year out. The deconstruction of Mario 64 was a little generous, but did make the point quite clearly that thought into abstract design principles might have big payoffs down the implementation road. So, a bit rhetorical, but it convinced me. Schreiber and Brathwaite’s “Challenges” book makes use of the concept of “atoms” of game design, which is a similar conceipt, in that they are attempting to provide defined primitives for discussion of games design. This formed the basis of the Lesson 2 discussion as well. I wonder if a similar discussion of pedagogy would be fruitful? Come up with a theme or objective. Create a set of rules to let the player move from place to place. BallpointSumo is for 2 players, although it could be single player at a push for training. You will need two ballpoint pens (preferrably not the end button retracting kind) or soft leaded pencils (not too sharp) of different colours, and a piece of paper. Both players play by controlling their pen(cil) with one finger at the blunt end while the point is in contact with the paper; carefully balancing the angle allows players to push the tip to draw a faint line. The skill involves judging the correct angle: too shallow and the pen will fall; too steep and pressure will not draw a line. Both players start in the centre for an evenly matched game, but handicaps can be allowed by starting in circles closer to one end or the other. The goal is to WIN in the last circle nearest to the opponent. It would be expected that some back and forth might occur, so a time penalty could be appointed and a win on points be declared by who was nearest to opponent’s end. Each balanced pen(cil) is a Sumo wrestler trying to unbalance or push the opponent out of the circle; aka “Fell Mighty Tree”. If a nib moves out of the circle or finger loses control then that player moves back one circle towards their end and prepares to battle again; aka “the short hop of lamentable defeat”. If both pen(cil)s fall or leave the circle at about the same time, the loser is the one with the least distinct or most broken line, or a draw can be declared. The mechanic is to use your pen(cil) to push/trip/bump the opponent into losing control and falling or leaving the circle. The winner has to then navigate their Sumo Wrestler from the current circle to the one where their opponent is waiting; it is acceptable for the player to reset their finger before attempting the “Long Walk to Victory” but this allows for and requires the current victor to be at a slight disadvantage because they have to successfully maneuver their Sumo to the next dojo. Once successfully navigated to, but not through or out of, both players can reset their hold on the pen(cil)s before beginning a bout. Bouts basically involve moving your finger to control the pen(cil) into pushing the opponent out of the circle. An alternative strategy exists, because a player might simply plant their pen(cil) vertically with a strong downward pressure; aka “Stand like Tall Oak”. As this could lead to a stalemate and be rather boring, an opponent can “Bend like Gentle Willow” by drawing a controlled line – nib does not leave paper, finger does not drop, with a continuously drawn line into next circle, stopping to show control of the nib. If achieved successfully, the opponent will have to move back to join the currently winning player. Again, both players then have the chance to reset their grip before the bout begins again. This option would not be possible as a victory condition in the final edge circle, as there would be nowhere to ‘bend’ to. So, at least one proper bout will be needed to win. Clearly, this second strategy is risky, as it involves (potentially deliberate) leaving the current circle, but it allows for greater variety. The super risky third approach, “Flow like Running River” would be to draw an uninterrupted line from the start circle through all the intermediate circles, with a pause in each to show continued mastery, to the opponents end, with no jumps or loss of control. However, one bout in the final circle would still be needed, and I think that this should only be a tie break option. This is a non-contact sport with only pen(cils) and controlling finger able to contact the opponent. Hand contact with opponent’s body, finger or pen(cil) will receive a first warning, then concede a point by moving back one circle. If this occurs in the last circle a foul will be awarded as a victory against the fouling player. A victory in the circle nearest the opponent’s end, either by getting there first with Willow or River, then winning a bout, by opponent fouling, or by simple Sumo wrestling – “Dig up Stump!” – in each circle one at a time. Post Lesson 2 post-mortem: After playtesting three things became apparent. The first was that the winner of a bout guiding their pen forward to the next circle was just too hard for most people. It was, therefore, decided to scrap/simplify this constraint. Subsequently, the ability to side-step combat by drawing a line to the next circle was also removed, due to the difficulty spike. It had been originally put in to provide an alternative strategy, because it was thought that a conflict only game would be too samey; actually, this was not necessary as play testing never highlighted bout only play as a problem. This was an example of over-complicating things unnecessarily. The third issue from gameplay testing with young children, young adults and seniors – ages ranged from 8-70 – was the rule that the clearer line wins when both pens leave the circle at the same time. When people of different strengths played together it was quite common for there to be bouts where both pens shot out of the circle. Clearly, when only one pen skidded out there was an obvious winner. When both left, but one was measurably before the other, again a winner was straightforward. However, the rule of clearer line was expected to be seen as a mistake prior to testing. In fact, the surprise of testing was what seemed to be an inconsistency, was a perfect way to balance game play. When a 9 year old girl played with a 17 year old sporty boy, the latter’s attempts to force his opponent out of circles, consisting of brute force, frequently resulted in both pens falling, but his making a fainter line, resulting in a loss. This was an unexpected bonus in playtesting. therefore, the anticipated removal/reversal of this rule was not justified. The only caveat being that after extended play – think Roddick v Federer! – the paper gets rather marked up, making calls difficult/easier to contest. In playtesting, we just called draws more often than expected. When the paper gets scuffed up, new paper or circles drawn in different places might be necessary. So, some changes, some justified non-changes. A simpler game.